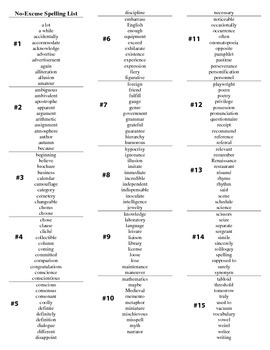 This handout contains 15 lists of commonly misspelled words. I used this handout with 10th graders before we began our writing unit. Each list includes approximately 11 words that are in alphabetical order. Words vary in difficulty, but all are commonly misspelled by secondary students. My students definitely do not enjoy their weekly spelling quizzes because they are "too old;" however, these quizzes help so much more than they hurt. Continue spelling practice through middle and high school to build student skills.